Rachelle Diaz-Boyas has participated in her church’s choir for the last 5 years. She also volunteers at summer camps each summer and plays soccer for the club and school. For work, she coaches junior league soccer and teaches Spanish to kids. While doing so, she has maintained a 3.2/ 3.4 weighted GPA. Teachers describe her as kind, compassionate and tenacious. Rachelle plans to go to a four year college and major in business with a minor in psychology. She would like to have a career where she can work in mental health and financial accounting. She will be the first generation in her family to attend college! Jennifer Hernandez-Botello is an officer for the Mecha club. She assists in planning meetings, volunteers in the community and performs cultural dances at assemblies. She is also a peer tutor and has spent 450 hour helping students with disabilities in their classes and in the community. Her jobs have included working at West Hill Health & Rehab, and most recently Starbucks. While doing so she has maintained a 3.6/ 3.8 weighted GPA. Teachers and employers describe her as motivated and intuitive with a great work ethic. Jennifer’s ultimate goal is to open her own café shop. She is so passionate about this goal that she got a job at Starbucks to get relevant experience! After high school, she will be going to college to study business and then work to open her own business. Enrique Marshall is part of the Future Business Leaders of America (FBLA), Tualatin High School Advanced Business Procedures, Varsity Tennis Team, the high school’s newspaper, National Art Honors Society, Film Club, Homework Club, and the National Honor Society. All while working at Nordstrom and maintaining a 3.98/ 4.2 weighted GPA. Teachers and counselors describe him as a natural leader, extremely creative, compassionate and inquisitive and highly collaborative. Enrique plans to go to college in New York, NY at the Fashion Institute of Technology to major in fashion design and minor in Spanish and color studies. Sydney Oleson is on the varsity track team. She is also in Key Club, Amnesty International Club, Health Occupations Students of America, Concert Choir and on the Concert Planning Committee. She has been a Red Cross Blood Drive Coordinator executing a flawless blood drive at Tualatin High and Summer Youth Corps member. While doing so, she has maintained a 3.46/ 3.48 weighted GPA. Teachers and the Red Cross describe her as self-starter, an excellent communicator with a passion to help others. Sydney plans to attend a four-year university and receive a degree in medicine. This would allow her to serve the people who need health care the most. She plans to work overseas with Doctors Without Borders as a Radiologist working in humanitarian aid. Our congratulation again to all four recipients. 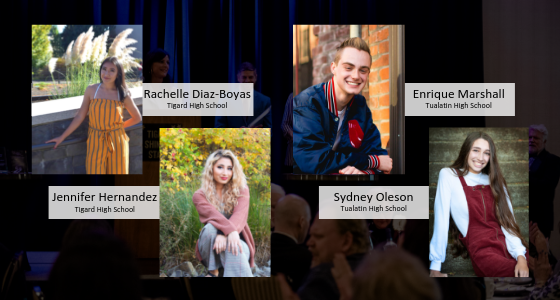 These scholarships will be formally presented with other Tigard volunteer and business awards at Tigard’s 2019 Shining Stars Community Awards Gala. The event will be held on Friday, May 3rd from 5:30 to 9 PM at the Embassy Suites – Washington Square, our event location host. With a theme of travel, this elegant themed event includes a silent auction, dinner, dessert dash, awards and more. Tickets are $60 per person. Get ready to travel the world and join us to celebrate Tigard! For further details about the Tigard Shining Stars Community Awards Gala, please contact the Tigard Chamber of Commerce at 503-639-1656 or at Jessica@tigardchamber.org, or go to our website at www.Tigardchamber.org. Buddha said something like, expectation is at the root of all suffering. Whether you subscribe to that theory or not, you can likely agree that client or customer expectations can set the stage for a terrible business review. You see, excellent service doesn’t matter if they expected pizza at your Italian restaurant and it wasn’t there. 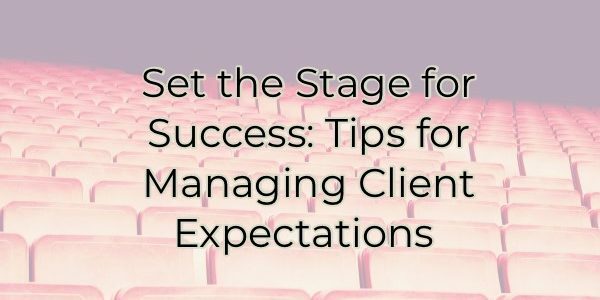 Since most customer expectations can be managed before they become issues, it’s wise to ensure everyone is focused on the same thing and the same outcomes. Here’s how you can make that happen. If you have a stringent return policy or don’t allow for substitutions, be upfront about that. Don’t hide it in small print. Make sure if someone is purchasing something that cannot be returned it is communicated in writing and orally. Also, ensure that your customer-facing employees understand the policy and why it’s in place. If they don’t, and a customer complains, they may very well jump on the complaint bandwagon and that’s bad for everyone. This applies to inabilities as well. Several months ago, romaine lettuce was unavailable due to a recall. This severely impacted restaurants that serve Caesar salads. Unfortunately, many customers who knew about the recall didn’t think about that favorite salad. If you’re unable to deliver on something you normally do, don’t wait for someone to ask for it. Tell them ahead of time so you can manage their expectations before it becomes a major disappointment. If you put a program in place that educates your clients on process and escalation procedures, they’ll feel more of a part of your company and will likely know what to expect. Communicating these things keeps your customers from inventing them, which is often far worse. This is similar to setting a date above. Don’t promise something you’re unsure you can deliver on. Many small businesses take on large projects hoping they can get it done. They plan on building a name for themselves with the new undertaking. But that fails to happen. If you can’t deliver on what was promised, you will make a name for yourself but it won’t be a good one. For the love of business, think twice before sending out one of those over-done, lengthy surveys. Keep your language fun and the survey short. Spend time on your subject line (if you’re sending it via email) so people will open it. Don’t ask every time a customer or client works with you. My vet sends me one on every visit even if I’m just buying dog food. That’s too much. I rarely ever answer anymore. Better yet, use a fun, interactive survey. For instance, in your waiting room or lobby, use emoji magnets or paper faces to vote on how well they think you’re doing. While setting expectations and communicating limits and process are good things, know that most people are aware of the trend of customization that is affecting all industries. This trend is encouraging people to follow the once popular Burger King motto, “Have it your way.” With this change, you can expect that many of your customers aren’t going to like overly stringent return policies and other stipulations. Find the right mix of expressing policy and procedure with doing right by the customer. It doesn’t mean you can’t have processes in place. It just means you have to empower your staff to differentiate between when the right time to set customer expectations is from the time to blow those expectations out of the water. Our OSCC lobbyists are at work analyzing the 1,500 bills that have been introduced to date in the state legislature. Here’s a list of major revenue-related proposals that are drawing attention in Salem. Gross receipts tax (GRT): Despite voters’ overwhelming rejection of Measure 97 in 2016, this concept remains a favorite of some influential legislators. Portland voters approved a citywide gross receipts tax on large businesses in November. The existence of a GRT in Portland will give proponents a toehold to push for a similar approach statewide. However, a GRT remains a particularly difficult tax for low-margin businesses, regardless of size. Business activities tax: The Oregon Business Plan has floated a business activities tax (BAT) as an alternative to a GRT. The BAT, used in Washington, does not create the same concerns about pyramiding (being applied multiple times in the supply chain) as the GRT. However, it still would raise business costs and, depending on details of a specific proposal, could affect some businesses more than others. Corporate tax rates: If neither of those ideas gathers support of 60 percent of both chambers, the Legislature could default to keeping the current tax structure and increasing the corporate tax rate. Meanwhile, the Governor’s budget proposes an increase in the corporate minimum tax. Small-business taxes: Small businesses have been in the crosshairs of revenue hunters in the Legislature for the past two sessions. In 2017, the House voted to roll back portions of the small-business tax deal that were part of the 2013 “grand bargain,” but the bill failed in the Senate. In the 2018 short session, the Legislature disconnected from a portion of the new federal tax law that benefited small business. 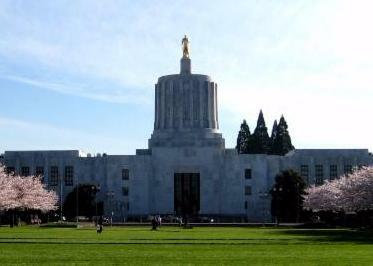 Senators Brian Boquist (R-Dallas) and Herman Baertschiger (R-Grants Pass) have sued, contending that legislation violates the state Constitution. Meanwhile, Governor Brown, who is named in the lawsuit, has proposed more rollbacks of small-business tax benefits – trimming a tax break that passed in the 2018 session with her support. Other business taxes and fees: The long list of legislative concept drafts presented in the House Revenue Committee last week during Legislative Days includes an assortment of technical tax adjustments that would increase taxes paid by businesses. Also, some tax credits could be eliminated through the tax credit review process. Kicker reform: The idea of ending or diverting the “kicker,” which returns money to individual taxpayers when revenues exceed state economists’ projections by more than 2 percent, has been kicked around for years. In 2012, Oregonians voted to designate the corporate kicker for education funding. Now, similar proposals to use the personal kicker for targeted uses such as PERS or education, have support. Kicker reform is one revenue option included in the latest version of the Oregon Business Plan, which was unveiled earlier this month. Property taxes: The discussion about reforming Oregon’s property tax system has amplified in recent months. The goal would be to eliminate inequities that lead to landowners with similar properties paying differing rates. Even by revenue reform standards, this would be a complicated process, and, therefore, is less likely than some of the other revenue proposals. However, targeted bills aimed at businesses’ property taxes could gain traction. For example, one bill would limit the property tax exemption for nonprofit hospitals to the amount spent on charitable care, reduced by the sum of all amounts of compensation reported in excess of $1 million for any individual directors or employees. Alcohol and tobacco taxes: Increasing tobacco taxes is a common revenue proposal, one that is included in the Governor’s budget. Although the Governor has backed off of talk of a higher beer and wine taxes, her budget does propose increasing alcohol costs another way – by increasing the markup on liquor at state stores by 5 percent. Medicaid taxes: The Governor’s budget proposes a mix of taxes and fees to make up for a projected shortfall in Medicaid funding. The money would come from: increased hospital taxes, expanded taxation of health insurance plans, higher cigarette taxes and an assessment on businesses with a large share of employees who qualify for Medicaid. Transportation taxes: The 2017 Legislature passed a transportation package, and taxes to pay for improvements are beginning to kick in. These include increases in gas taxes, higher registration and title fees, a 0.1 percent payroll tax, a bicycle excise tax, and in 2020 a new way of treating vehicle fees based on miles per gallon. Carbon taxes: Representatives of the Governor’s office presented a carbon-price proposal to the Joint Committee on Carbon Reduction during Legislative Days last week. The model being discussed is a cap-and-trade system. Dozens of decisions remain that will determine the cost of this program to businesses, but under any scenario there will be significant costs. The question, is which businesses and consumers will pay, and how much. If a cap-and-trade bill passes, higher fuel and energy costs are all but certain. As you can see, raising revenue will be one of the dominant themes of the 2019 Session. We will keep members apprised as the discussions roll out. The 45th annual Tigard Shining Stars Community Awards Celebration recognizes and honors Tigard citizens who demonstrate excellence and community leadership in volunteerism, educational achievement and business. The fun, semi-formal dinner event and silent auction held at Embassy Suites Washington Square, celebrates our vibrant Tigard community and the individuals who make it so with awards, dinner and silent auction. Awards include the Jim Nicoli Youth Volunteer Award, John E. Cook Tigard’s First Citizen, a “From the Heart” Volunteerism Award (in honor of Jim Hartman), $3,000 in scholarships to deserving high school seniors, and Chamber awards for Chamber Business of the Year, Volunteer of the Year and Ambassador of the year. This is the chance for Tigard residents to recognize, celebrate and say thank you to the people who work so hard all year long to enhance the community that we live and do business in and truly make Tigard “A Place to Call Home”. Nomination criteria and form download links are outlined below. Named in honor of John E. Cook, this award recognizes someone who has made in-depth, long-term volunteer contributions to the Tigard community over the years. The winner is active, involved, interested, and enthusiastic about making Tigard a nice place to live and work. This individual excels in any area of unpaid endeavor of education, social services, youth work, and community improvement of public services. This award is given in the spirit of all volunteers who remain unknown. The recipient joins the ranks of those previously honored in continually striving to improve the Tigard Area. This award honors a person who has dedicated their time and energy to a specific cause in the Tigard community. Jim Hartman set the standard for this award by his example of giving from the heart to his community. This person gives willingly, energetically and consistently. This person might be well known or might be a “quiet” volunteer, unrecognized until now, but always gives “from the heart”! This person may have worked on the same project for many years. This award is given in honor of former Mayor, Jim Nicoli, who passed away in 2000. His dedication to the youth of our community was a fitting way to honor his name and award a youth in our community who volunteers to make a difference. Many young people in Tigard are active in volunteer efforts and it is our pleasure to acknowledge their contributions of dedication, energy and community spirit. They are the future! This award recognizes a chamber business that has made in-depth contributions to the Tigard community through their business. The winner is active, involved, interested, and enthusiastic about continuing to make Tigard a destination of choice for local business. Nominee must be a chamber member in good standing. This award honors a Chamber member who has volunteered many hours of time, talent and energy to the success and growth of the Tigard Chamber. Bert Tousey and his example of Chamber volunteerism is commitment at its best. This person is an example of an active member who has sustained their efforts on behalf of the Chamber over a long period of time. By their efforts, they have made this organization more effective in serving the Tigard community. Being an Ambassador for the Tigard Area Chamber of Commerce is no small task! The Ambassador of the Year Award should be presented to a volunteer who significantly affects a positive perception of the Chamber through active participation, an optimistic attitude and solid business practices. The recipient is active, involved, interested, and enthusiastic about making the Tigard Chamber a great organization to be a part of! Any individual or organization can make a nomination with the exception of Ambassador of the Year. All Nominations are due by March 1, 2019. Jessica@TigardChamber.org or call 503-639-1656. www.TigardChamber.org. If you do a lot of your own marketing for your business, you need to be able to write. But before you start worrying about what that looks like, consider it’s a lot less formal than when your high school teacher talked to you about persuasive essays. Today, it’s all about connections. You don’t need a marketing degree to be a good copywriter nor do you need a degree in creative writing to be a good writer. You can learn the tricks of good, written content creation on your own. Here are 15 web writing tips to get you started. Ditch the fancy talk unless that’s what is required by your audience. Instead, write as if you were speaking to them. Good spelling and grammar are important but using five-seven sentences in each paragraph is not. Don’t use business school jargon in your writing. You know the words like circle back, bandwidth, zero-sum proposition? When in doubt check this list or re-read #1. Keep your sentences as simple and short as possible. What they teach you in school is business essay writing. It’s boring, overly complex, and repetitive. Today’s skimmer wants bullet points, conversations, and short paragraphs. If you have something really important to say, place it in your article’s body but also add it as a pull quote. A pull quote is often seen in a magazine where a line of text is set in a text box on its own. They are larger size and font than the body text and get lots of attention because they stand out. Just write “fish.” It fits in better. While you want to avoid lines for a more fun-filled break, you don’t want nouns (the beach and your in-laws) in a list that also features a command. If you’re creating a list make sure all the words or phrases are written the same way and answer the question in the same tone. If you’re using nouns, keep it flowing and don’t mix up the directives. You know how as a child you spoke differently to your teachers than when hanging around with your buddies? You likely still do it. How you speak to your friends varies greatly with how you converse with your boss. Understand who you’re writing for and use the way they speak and their interests to flavor your writing. The length of your writing depends on your audience and what they prefer. However, the current trend is opinion pieces are shorter, while informational articles are trending towards longer complete guides. But feel free to mix it up as long as you don’t see a big dip in your readership. I was wanting to fire him, so I did. 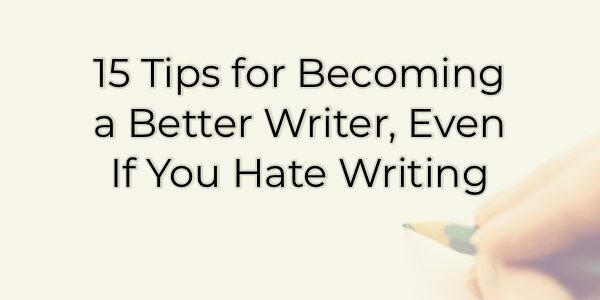 Being a better writer often just means covering areas of interest to your ideal customer. When people are reading about something of interest that is helpful and valuable to them, they will think you are a better writer. If you’re writing for business, you probably want to talk about your business. But it’s more beneficial to you to provide solutions for your audience than to make it all about you. Just as in conversation, you want to engage the other side and not just talk about yourself. Show your personality in your writing. If you tell jokes, use them in your articles and blog posts. If you make up your own words, continue to do the same. Reading your writing should help bring people closer to you; help them know you better. They should read your articles and “hear” you in them. People connect with stories so share what’s going on in your life such as things you’ve learned or experienced. Tie your information into something personal. Okay, so this doesn’t make you a better writer per se, but it does make your writing more enjoyable. People love seeing images. You can use image quotes, images that convey meaning, or even GIFs that add humor to your text. Also, whatever you write should always have a second life. Share a quote from the article on Facebook. Create an image quote out of a part of it. Update the statistics in it at some point in the future and publish an updated version. Stitch it together with several other articles and create an ebook. Build onto the article, going more in-depth, and create a free giveaway. Add a little of the content or a question from the article in your newsletter to pique interest. When it comes to business writing, never stress about the grades you got in high school English class. Those have nothing to do with your ability to write for your business. Today’s business writing focuses on building connections not formal, persuasive arguments. Think about it as a written conversation you’re having with clients or customers. It’s an ideal way to help them out and assist them in getting to know you better.